You Need a Burrito Boxed Lunch! When you are looking for a solution to your office lunch treat dilemma, turn to Qdoba for the answer. We offer a great option in our Burrito Box Lunch. We have three standard burritos for your guests or employees to choose from to satisfy their hunger. They choose the Adobo-Marinated Grilled Chicken Burrito, the Adobo Marinated Grilled Steak Burrito, or the Vegetarian Burrito. You can also choose a custom-made, hand-crafted burrito to make it just the way you like it. All of our burritos are Mission-style, which means they are big and satisfying. The secret is that we load them up with our signature cilantro-lime rice, slow-simmered black beans, cheese and salsa, and, of course, our hand-smashed guacamole, plus the ingredients that set them apart. Mission-style burritos will satisfy your hunger and your craving for the best Mexican eats! Todos los adornos is how we serve our catered burritos. Your choice of burrito is accompanied by chips and salsa and your choice of a chocolate chip cookie or a double chocolate brownie. You can also order bulk lemonade or bulk iced tea for just a few dollars more. 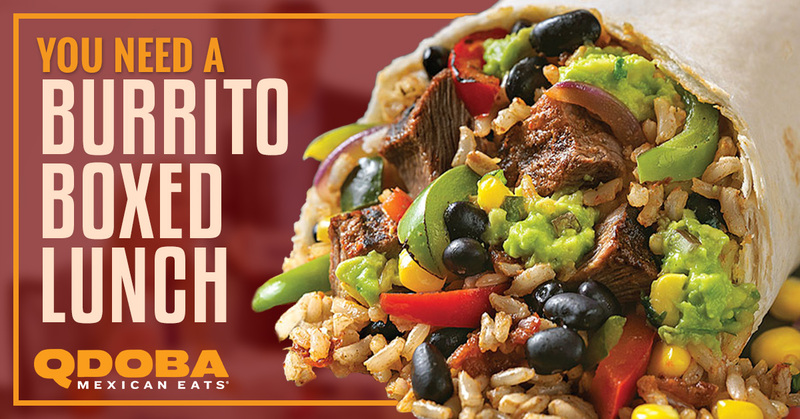 When you sign up for Qdoba Rewards, you earn points that can be redeemed for free entrees or drinks. We need only about 24 hours of notice to get your catered meal ready and delivered to you. There is a $25 setup fee, and we include everything you’ll need, including cutlery and napkins. Contact our Laramie Mexican catering team today!